I have a strong likes for bitters, perhaps it is from childhood training of drinking Chinese medicine. Somehow that piece of dried plum the herbalist offers as an after treat made it all worthwhile. As I continue to search for more ways to improve my iron levels, I turn to my herbalist for advice. I have been drinking nettle tea with molasses but find that body still needs more iron. My herbalist ran down the list of suggestions like nutrient dense diet, probiotics, fermented vegetables... which I am already complying with, then she suggested yellow dock. Besides being rich in iron, yellow dock is known for it's liver detoxing properties. I asked what it taste like and she said "bitter" and let me smell it. She was probably a bit surprised when I said that I liked the smell which is a good sign. I believe our senses guide us to what are body needs. I bought a little to try. 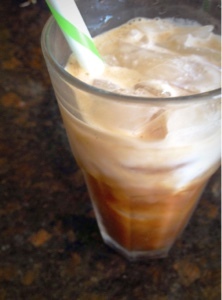 When I got home, I decided to play up the bitterness of the herbs and after a few tries I created this AIP version of iced coffee. I find it to be a refreshing drink with a sweet bitter kick, with the coconut milk, it makes a treat on a hot day. Because I am naturally drawn to bitter flavors, I am very interested to hear what other people think. Is it too bitter? 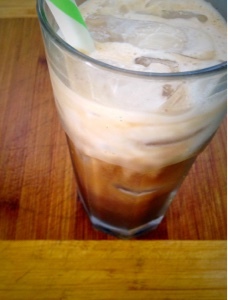 Does it remind you of an iced americano? Please let me know.